The schoolhouse was built on a 1-acre parcel that was part of a large tract of land of approximately 100 acres owned by Wilson J. and Daniel J. Smith. The Smith family operated a coal bank on another portion of the property near the Valley Railroad. The Smith Brothers gave title to the Board of Education of Green Township in 1901. The Green Historical Society thoroughly researched the architectural and historical significance of the property. However, the construction date of the schoolhouse remains a mystery. The Summit County Recorder’s Office lists the construction date as 1870. Unfortunately, the original records that this date was based upon are no longer available at the Recorder’s Office. A map of Green Township from 1891 does not indicate a schoolhouse at the location of Aultman School. The 1891 map illustrates 14 districts within Green Township and two joint districts with Stark County. The Aultman area is illustrated as part of District 6 and a schoolhouse in shown within District 6 to the south on the land of Frederick Boettler. The hamlet of Aultman spread across the western edge of Green Township and ran along the railway line into Lake Township in Stark County. Aultman extended along Greensburg Road toward Greentown. A map from 1896 of Lake Township labels the Greentown/Aultman district as a ‘Special District’ and the districts runs to the Green Township line near the schoolhouse. It is also possible, though unconfirmed, that this schoolhouse was part of a joint or special district with Lake Township. 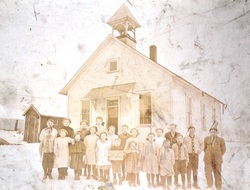 It is assumed that the schoolhouse was built to service the expanding population in the Aultman area. The population of the Aultman area was growing from 1870-1910. Greentown Station (actually located in Aultman) was a railroad depot constructed in 1878. The Valley Railroad had service from Cleveland all the way to Canton beginning in 1880 on the line running through Aultman. In addition to the railway and the active coal bank already mentioned, a clay deposit was mined in Aultman as early as 1864. Using the mined clay, tile, pipe, and brick were made by the factories of the Stripe Brothers and the H. B. Camp Company. These companies collectively became the National Fireproofing Company, commonly referred to as Natco. In addition to industry, the Aultman area also had a picnic area called Water Shed Park and a camp meeting site called Highland Park. Highland Park was first used to hold religious tent revivals and was later used for recreation and camping. 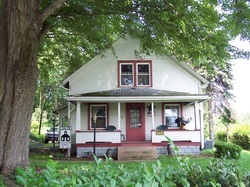 The Witsaman Family has preserved the property since it was sold by the Board of Education. Wilbur Witsaman purchased the schoolhouse from the Board of Education in 1923 and carefully converted the property to a private residence. Glenn Leroy Witsaman and his wife, Rebecca B. (Stadelman) Witsaman, are the current property owners and residents. Glenn Leroy Witsaman is the son of Glenn Homer Witsaman and Carolyn Marie (Heisa) Witsaman and the grandson of Wilbur Witsaman and Anna Marie (Yenny) Witsaman. According to the Witsaman Family, Wilbur Witsaman and Anna Marie Yenny were school classmates at Aultman School. In 1914 Wilbur and Anna Marie were married. According to the Witsaman Family, Wilbur and Anna Witsaman moved to the schoolhouse with a horse and buggy from the home of Anna’s sister (Leah) on the south side of Greensburg Road. Wilbur and Anna Marie had five children, Carl L., Arline, Roy, Glenn Homer, and Dawn. Architecturally, the schoolhouse reflects its varied history. The schoolhouse is a gable-front frame cottage with three bays on the main facade. The original narrow beveled board siding is intact. While retaining the footprint and character of the original frame structure, the home also reflects many features typical of 1920’s craftsman or cottage/bungalow style. These craftsman style elements are compatible with the original architecture of the structure. The architectural features of the property illustrate the property’s two distinct histories: an 1880’s schoolhouse and a 1920’s homestead. The Aultman Schoolhouse is not only significant as a historic schoolhouse and a cottage-bungalow home; it is also one of the last structures representing the once thriving population of Aultman.